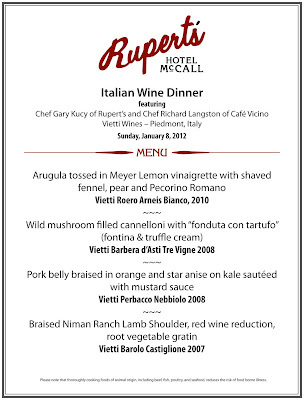 Rupert's is excited to bring guest Chef Richard Langston from Cafe Vicino to McCall for a special Italian Wine Dinner Sunday, January 8th! Working with Rupert's Chef Gary Kucy, the two have cooked up an amazing menu and perfectly paired each of the five courses with a Vietti wine. Check out the menu to get a sneak peek of what you can expect to taste at Rupert's! Reservations are still open, but space is limited! Call 208.634.8108 to make your reservation today! Wine Dinners at Winter Carnival!